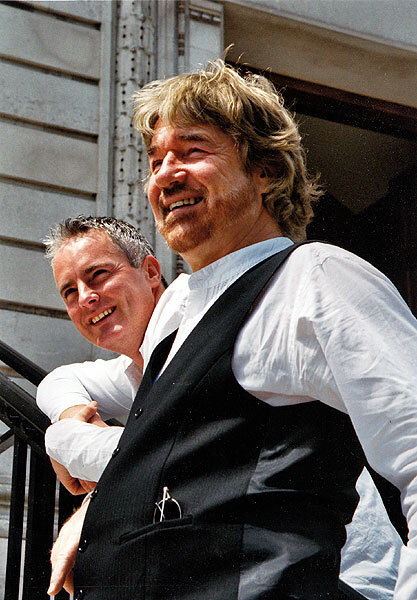 Willy Russell with Tim Firth (in background), photographed for the tour of ‘In Other Words’. Photo: Paul Cary, 2004. Willy Russell is a playwright and musician whose work has enjoyed worldwide success and acclaim. He is best known for plays Educating Rita (1980), Shirley Valentine (1986), Our Day Out (1977), and the musical Blood Brothers (1983). Willy Russell’s works have been translated into numerous languages and won multiple awards for both theatre and film. The Willy Russell archive collection contains manuscripts, programmes, publicity and media material including newspaper cuttings and press releases, correspondence, legal, financial and administrative documents, records relating to the casting and audition process, audio and film material, and promotional ephemera. The collection was amassed by Willy Russell over the course of his career, and is a comprehensive representation of his work to date, with earliest material dated 1964. Working part time from October 2011 – October 2012, I was employed by Willy Russell to arrange and catalogue this personal archive collection. I was particularly fortunate to have the support and assistance of Willy himself during the project, meeting with him regularly to discuss items that I was unable to identify. He provided me with answers to questions ranging from the chronology of draft manuscripts to the identities of correspondents with illegible signatures. I was directly provided with context for the material, which enabled me to make connections and to appreciate the way in which projects, works and individuals related to one another, and to create more comprehensive descriptions of the material. The assistance of my colleague Louise Bruton, who worked on the project for three months, was also invaluable, as through discussion many of my queries and difficulties were easily resolved. In addition, I found the material I was cataloguing to be absorbing, from annotated manuscripts of Blood Brothers containing alternate endings and dialogue, to composing mental essays on the differences between Educating Rita and George Bernard Shaw’s Pygmalion (as a result of the continuing comparisons made in the media), to the insights provided by correspondence between Willy Russell and actors, directors and producers. The collection also provides insight into less well-known works, such as the Cantril Tales, a 1974 Christmas production at the Liverpool Everyman Theatre written by, amongst others, Willy Russell, Pete Postlethwaite, George Costigan and Adrian Henri, directed by Jonathan Pryce and featuring Matthew Kelly, Julie Walters and Bill Nighy. The project has presented some unusual challenges; I worked on the material at home which created potential problems in terms of security and suitable storage conditions. I was also aware that my catalogues would be used personally by Willy Russell, and publically for research at a Special Collections and Archives, which required a balancing of the requirements of archival cataloguing standards, and ensuring usability and ease of access. To improve accessibility, with assistance from an IT specialist, I created a database in Microsoft Access which allows the entirety of the catalogue to be searched by keyword, and also provides the potential for Boolean searching of the catalogue fields. Once the project was completed, I was pleased to assist in negotiating the collection’s deposit with Liverpool John Moores University. We hope to make the collection as accessible as possible to students at the University’s departments of Drama, English and Graphic Arts and to researchers, but also to promote public access. Future intended projects include the digitisation of selected items from the collection to assist in ensuring their preservation, and the cataloguing of an additional collection consisting of photographs collected by Willy Russell. Willy Russell will give a talk at the University in October 2013 which will be accompanied by an exhibition of material from the archive. The Willy Russell’s Archive is now available for access at Liverpool John Moores University’s Special Collections and Archives department. For further details, please see the LJMU press release.